When it comes to studio monitoring, Dynaudio are always right up there with the big names, their range covering everything from project studios to full-blown pro studios and broadcast facilities. 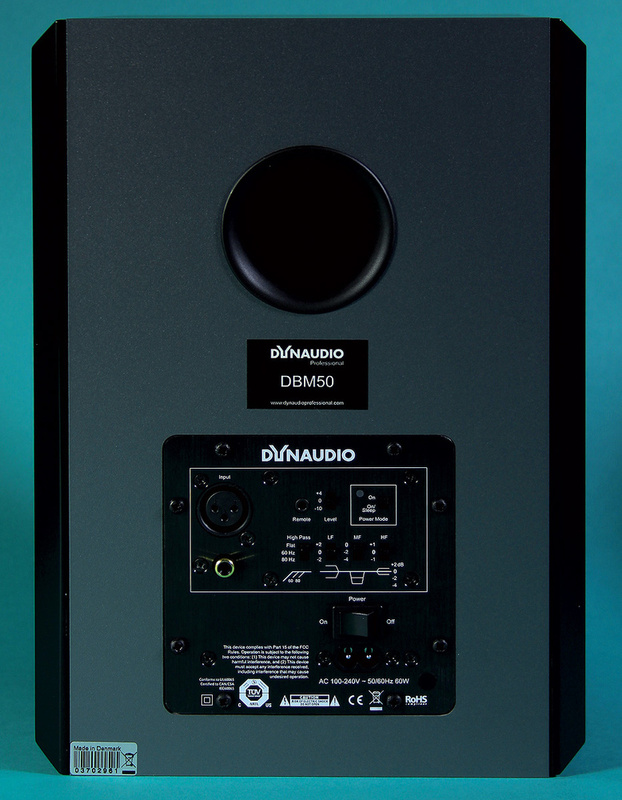 The new DBM50 is designed to bring Dynaudio quality to desktop monitoring, and though the description pitches them as nearfield speakers, there's more low-end extension than you might imagine. The physical shape and two-tone finish of the cabinets is certainly eye-catching. Incorporating hand-built Dynaudio drivers, this two-way, active system combines a 7.5-inch, long-throw woofer with a three-inch voice coil. This is paired with a 28mm (one-inch) soft-dome, magnetic fluid-cooled tweeter. Both the woofer and tweeter voice-coils use aluminium rather than copper wire, and are driven by a pair of 50W (RMS) power amps. A safety-bar arrangement affords the dome tweeter some protection. A waveguide is used to control the tweeter directivity, while the box itself has a sloping format that enables practical desktop mounting options. 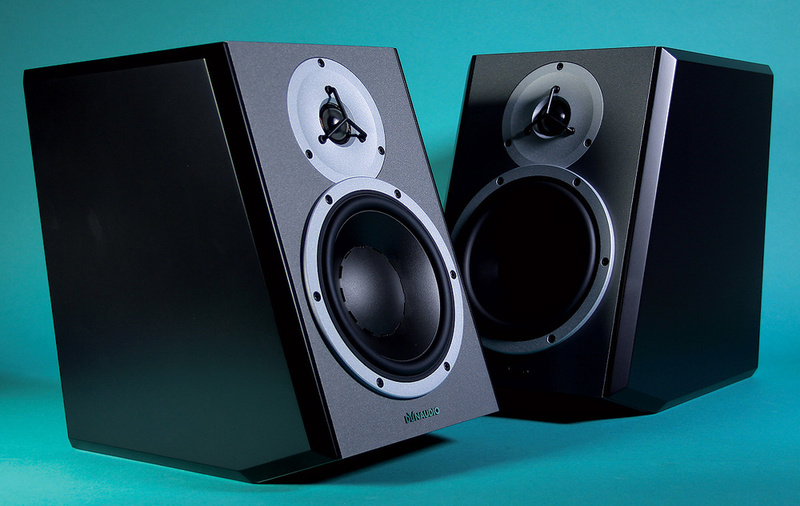 Desktops are usually too low for speaker mounting, but when placed on a tabletop, the DBM50s' drivers aim upwards towards the listener, although they may also be placed on their sides if used on a meter bridge. These are not physically large speakers, and the power-amp rating is modest compared with some monitors, but the high efficiency of the drivers allows for peak SPLs of up to 117dB at one metre. There's also little need to look at subwoofers to go with these, as the frequency response of the speakers is quoted as 46Hz to 21kHz (±3 dB), although, where applications demand it, they will work quite happily alongside a subwoofer. The DBM50 back panel houses the balanced and unbalanced audio inputs, as well as the extensive EQ controls. At the back are inputs on both balanced XLR and unbalanced RCA sockets, and there's a further connector for the optional remote control, which provides level adjustment. A three-way sensitivity switch sets the input gain to +4dB, 0dB or -10dB, and there are response controls in the form of high-pass, low-shelf, high-shelf and mid-cut filter switches. A slide switch sets the high-pass filter to off, 60Hz or 80Hz. The 80Hz setting would be useful for accommodating a subwoofer. The LF switch has settings for +2dB, flat or -2dB at 150Hz, while the HF control allows 1dB of cut or boost at 1.5kHz, as well as providing a flat option. 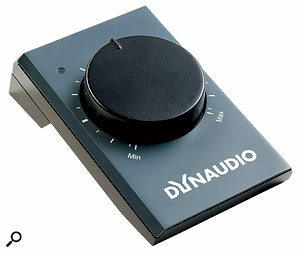 Finally, the MF switch can be set to flat, -2dB or -4dB, at 450Hz and with a Q of 0.7. This type of notch filter is usually provided to help counter the effect of desktop or console reflections. The cabinet houses the power amplifier and electronics, including the crossover, which is set at 1.5kHz with a gentle 6dB/octave slope. Overall weight is 7.2kg per speaker, and they have dimensions of 230 x 348 x 335 mm. As with most small monitors, the cabinet is a ported, bass-reflex design. In this case, the port exits at the rear of the cabinet and is tuned to 39Hz. The total cabinet volume is 13.9 litres. The mains input is on a hi-fi style plug, and an auto-standby mode saves power when no signal is being received. One factor of the design that may be a concern in some systems is that power comes in on a two-core cable, rather than the three cores you'd find on an IEC cable. No doubt the rationale is to avoid ground loops, and I'm sure all safety issues have been addressed, but if you happened to be working with a laptop-based DAW and a USB-powered audio interface, you might just find that your system wasn't grounded at all, which could result in irritating hums and buzzes. In such a system, it would be necessary to ground one point on the signal path, ideally using a proper grounding plug where only the ground pin is made of metal, with the dummy live and neutral pins being plastic. This optional remote level controller connects directly to the back of the DBM50s, and provides basic monitor-controller functionality. With the speakers mounted on my desktop and all the controls set flat, the sound came over as very detailed, with a respectable low end, although I felt the highs were a touch too forward-sounding, so I dropped the HF switch to its -1dB setting. This improved things, but the top end still sounded a hint more 'forward' in comparison with my usual monitors. In all, though, the sound was classic Dynaudio, with a detailed mid-range, good transient definition, and plenty of level in hand. If a mix is rough, the highs sound obviously harsh, whereas if a mix is smooth, these speakers will confirm that too — and that kind of honesty is something you need from a monitor. I also found the stereo imaging to be very clear. Lows come across as punchy and full-sounding, but still reasonably tight, indicating that the port tuning hasn't been overdone, as can be the case on many smaller monitors. Price-wise, these speakers are perfectly pitched for the more serious end of the home-recording market, but that also puts them into direct competition with the likes of Adam, Mackie, KRK and Event. If you were already considering any of those monitor models, though, I'd say it would definitely be worthwhile adding the DBM50s to your list of speakers to audition. There are similarly sized models in the same kind of price range from the likes of Adam, Mackie, KRK and Event. Angled cabinets make positioning on a desktop easy. 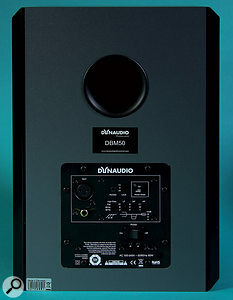 Familiar Dynaudio family sound, with plenty of depth and detail. Lack of a mains ground may be problematic in laptop-based systems with no other grounds. These are stylish and practical monitors capable of producing good results in small and medium-sized studios. It's possible to add a subwoofer if they're to be used in larger installations. £830 per pair; DBM50 controller £59. Prices include VAT. TC Electronic UK +44 (0)800 917 8962. $998 per pair. DBM50 controller $69. TC Group +1 519 745 1158.